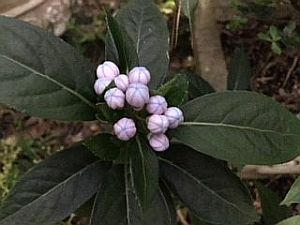 Dichroa febrifuga is commonly called blue evergreen hydrangea or Chinese quinine. It is a member of the Hydrangeaceae family. 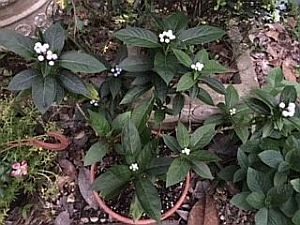 It is a compact, rounded, tropical, hydrangea-like, evergreen shrub which grows to 3-7 feet tall spreading to 5 feet wide preferably in part shade. It is native from Nepal to China. The leaves are glossy dark green tooth-like, pointed-elliptic (to 4-8 inches long and to 3 inches wide). The plant is attractive year-round. Blooms are five-petaled, bi-color flowers that are reminiscent of hydrangea and blooms from June-July in terminal inflorescences of 3-6 inches in diameter. Flower buds are white. Petal outsides are also white, the insides are blue. Flowers are followed by round, bluish purple berries (1/3 inch in diameter) which mature in late summer. The berries are considered to be the best ornamental feature of this shrub even though they can be hidden by the foliage. 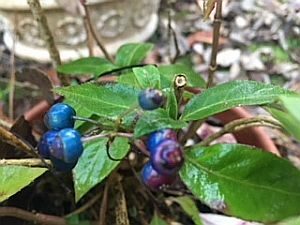 The stunning berries sometimes have a neon/iridescent look and usually remain on the plant into winter. Blue evergreen hydrangea does well to zones 8-10. 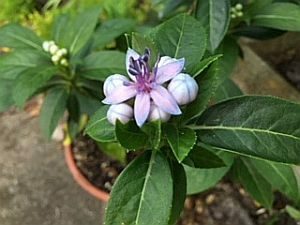 This tough shrub does not die back as a result of slight to moderate freezes in my garden. It is best grown in moist, acidic, organic soil. Propagation is by seeds or cuttings. Soil pH affects the tone and intensity of the blue flower color (dark blue in acidic soils to lilac or pale blue in alkaline soils). Add aluminum sulfate to the soil to make flower insides a deeper blue or add lime to the soil to make the flower insides lighter blue. This plant is used in Chinese medicine. It is said to be used for reduction of fevers, stomach cancer, to treat coughs, colds and bronchitis, to name a few. I do not suggest using this plant for medicinal purposes as the plant is suggested to be poisonous. I have noticed no serious insect or disease problems with this plant. Blue evergreen hydrangea is not only a good shrub for the garden bed. It is also attractive in pots and attracts birds. ©2010-18 Master Gardeners of Greater New Orleans. All Rights Reserved.